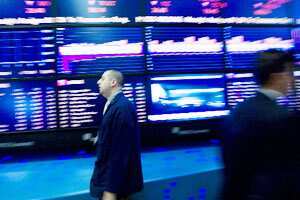 London: Positive US economic data lifted European shares slightly on Friday, the last trading day of a dismal year set to end with their worst performance since 2008. But gains were limited by investor reluctance to make big bets as worries over funding pressures for Italy continued to haunt. Yields remained at high levels following a bond auction on Thursday. The country faces €100 billion of bond redemptions and coupon payments by the end of April which is likely to make investors nervous going into next year. Banks, which have been the focus of the euro zone debt crisis due to their exposure to the region’s debt, are set to become the worst performers for the year, with the STOXX Europe 600 Banks index expected to end 2011 down 33%. “The year has been characterized by the European debt crisis and going forward it will depend on policymakers and how they implement better fiscal integration in the euro zone as to how markets will perform next year," said Veronika Pechlaner, a fund manager on the Ashburton European equity fund. By 03:30 pm, the pan-European FTSEurofirst 300 index of top shares was up 0.07% at 993.43 points but was set to close out the year down around 11.3%. Pechlaner said she was sticking to large cap companies with high dividend yields and favoured energy stocks like BG Group, which has a 12 month dividend yield of 1.02%. Energy stocks featured among the best performers, boosted by the improving economic data, and BG Group was up 1.7% making it one of the top movers on the FTSE 100 index. The energy sector has fared well throughout the year and the STOXX Europe 600 Oil & Gas index is set to end 2011 up 1.2%, making it the third best sector behind drug makers and the food and beverage sector.